IPAM and ISA IMAZON analyze the increase in deforestation in the Amazon in 2013 and make recommendations to the Government for this trend to be reversed. In 2013 , the 28% increase in Amazon deforestation put Brazilian society on alert. 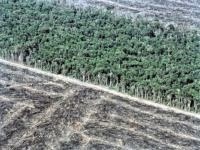 By and large, the deforestation actions were illegal. Since 2006, deforestation rates in the Amazon have fallen consistently. In 2013 , however, the 28% increase in Amazon deforestation put Brazilian society on alert. This increase should be considered unacceptable for three main reasons: deforestation in question was largely illegal, there exists in the Amazon region a large amount of area deforested but it is underused, and the Brazilian Government already has the key elements to combat deforestation in the Amazon. Aiming to reflect on the causes that led to deforestation and stimulate reaction by the Brazilian Government, the Environmental Research Institute of Amazonia ( IPAM ), the Socio-Environmental Institute (ISA) and the Institute of Man and Environment (Imazon), reflect the increase of deforestation which has occurred in 2013 in a document and we list a series of recommendations to reduce the rate of destruction of the Amazon rainforest. Among the various factors that may explain the increase of 2013, two of them are traditionally known: land speculation and the effect of infrastructure works without proper environmental safeguards. The combination of control strategies already established with some innovative approaches should be adopted so that the rate of felling the Amazon rainforest continues on a downward trend. For example , one must (1) maintain oversight focused on municipalities that concentrate the highest rates of deforestation, (2) create mechanisms that will dissuade buyers of products from illegally deforested areas, (3) proceed with the publication of the list of areas embargoed by IBAMA, (4) to continue the activities of the public prosecutor against companies that buy products from illegal logging. From the point of view of innovation it will be crucial to advance with (5) economic incentives for conservation and reduction of speculative deforestation, and (6) encourage forest restoration and regularization. Such incentives could include taxation, through a review of the tax policy of the federal government. In this sense, the analytical report on deforestation, 2013, released by the undersigned institutions, represents a first step towards a deeper reflection on the factors that make even the reduction of deforestation in the region a challenge. Thus, these institutions are placed at the disposal of the Government to thoroughly discuss the findings and recommendations presented. Brasilia , January 7, 2013 .